At the spring meeting of University College and Institute Professional Developers (UCIPD) hosted by University of Victoria’s Learning and Teaching Centre, Karen Belfer shared a story that exemplifies the impact of community of practice engagement and open practices. Karen is Dean of the Centre for Instructional Development at Vancouver Community College. She attended the fall workshop of the Educational Technology Users Group in Vancouver where Mary Burgess, Director, and BJ Eib, Instructional Designer, at the Centre for Teaching and Educational Technologies, shared a colour-coded poster type resource they use at Royal Roads University for communicating the professional development opportunities available to faculty. Karen decided to adopt the idea at her own institution, and implemented a modified, online version. It was easy for her to find the original resource because it was located on the Royal Roads University Open Educational Resources site, a project made possible through funding support from BCcampus. 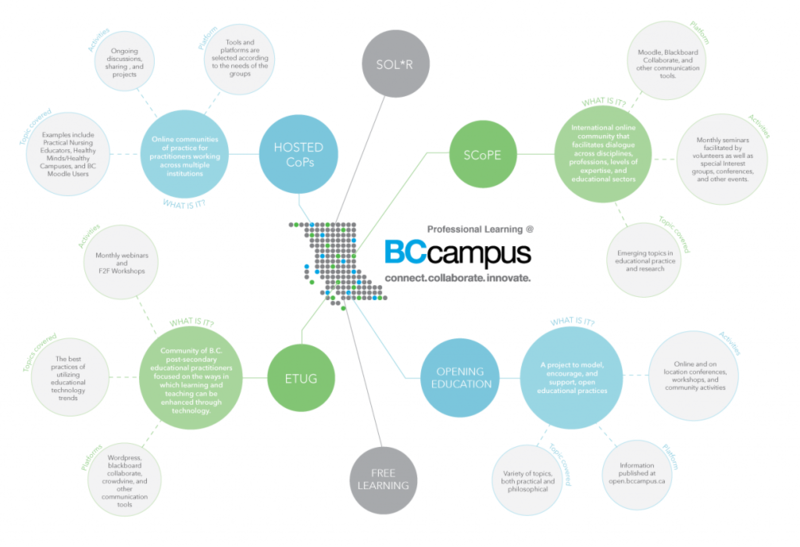 Incidentally, I was also inspired Mary and BJ’s presentation, and used their ideas for a similar resource to outline BCcampus Professional Learning opportunities. Here’s a sneak preview of the draft created by our talented co-op students, Hilda Anggraeni and Diana Chan.